St. Croix children get hands on experience with archaeological dig. 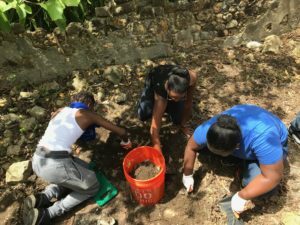 Four archaeologists have their work cut out for them as they excavate a slave quarters site at Little Princess Estate on St. Croix. The quarters were first occupied in the 1740s, but long after the slave period ended the buildings continued to be occupied as part of a public housing program in the 1950s and squatters lived there in the 1960s. The land is now under the care of the Nature Conservancy. “We really have our work cut out for us,” she said about dating the materials. 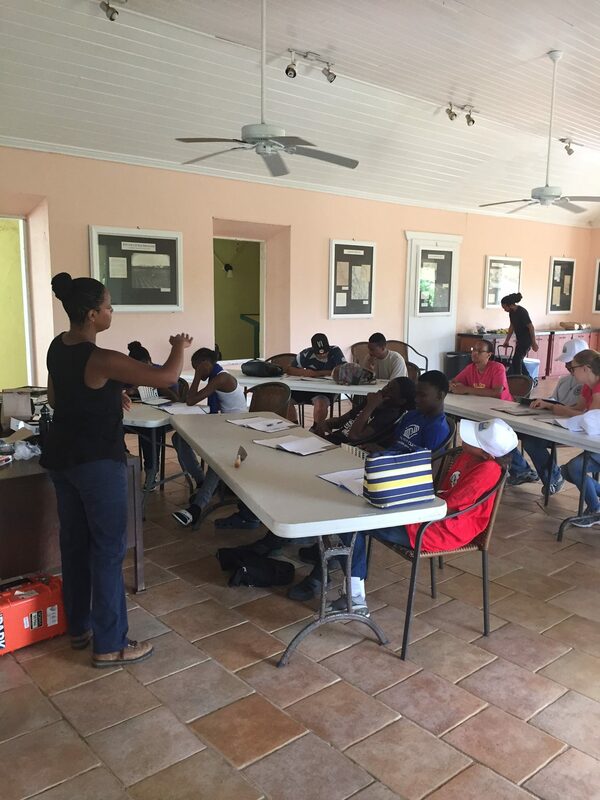 However, that challenge has not stopped her and her associates at the dig from bringing in 13 students from the Christiansted and Frederiksted chapters of the Boys and Girls Club of the Virgin Islands to expose them to what archeology is all about. 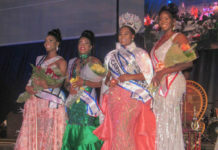 Dunnavant and Flewellen arrived on St. Croix Sunday along with Alicia Odewale. They have been joined by Alexandra Jones to make up the team. The team will be working at the site until the end of July. But their first item of business is working with the students from the Boys and Girls Club until July 1. Flewellen said the goal is to expose the students to scientific methods and also career opportunities. Boys and girls received archeology classroom instruction. 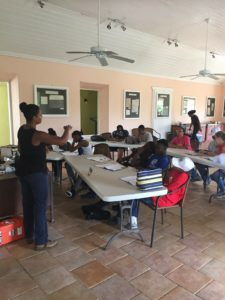 Flewellen and Dunnavant – co-founders of the Society of Black Archaeologists – first came down in June 2016 with members of Diving With a Purpose with the intention of establishing underwater and terrestrial archeology training programs for local youth. They talked to many local organizations and found the Boys and Girls Club summer program, Junior Scientists in the Sea, as a perfect fit. The project soon led to the certification of 12 young, local divers. The remains of four cabins have been identified at the site. Monday was devoted to cleaning the site, mapping standing structures, and setting up excavation units. It was decided to excavate between cabins 2 and 3 to get a better understanding of how shared space would have been utilized amongst the enslaved community. Jones, founder and CEO of Archaeology in the Community, said working with the youngsters was rewarding. “It is amazing to work with such brilliant young minds and to witness them make connections between what they already know and the new scientific techniques they are learning through archeology,” Jones said. The archaeological field school is led by members of the Society of Black Archaeologists and funded by the Slave Wrecks Project. 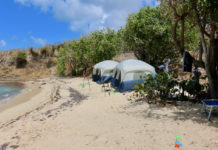 Collaborators include Diving With a Purpose, the Boys and Girls Club St. Croix, the Nature Conservancy, the University of the Virgin Islands, the National Park Service, Archeology in the Community, and Crucian Heritage and Nature Tourism. David Hayes of the St. Croix Archaeological Society helped with excavation equipment.